Want to reach a targeted audience of health-conscious moms? CrunchyMoms.com is a growing community and blog for moms looking to learn more about natural healthy living and parenting. We inspire and encourage women to do what is best for their children and families. With thousands of page views per day, we welcome like-minded sponsors. We have monthly and long term sponsorship options available. Crunchy Moms offers a variety of promotional opportunities. From text link advertising, sponsored blog content, product reviews, store reviews, banners, website branding, social media shout outs, or better yet – we can come up with a custom campaign to suit your brand’s needs. We will work with you to meet your budget and help you grow. The Header and Sidebar are seen throughout the content portion of the website. One 468×60 Header Ad is available each month. 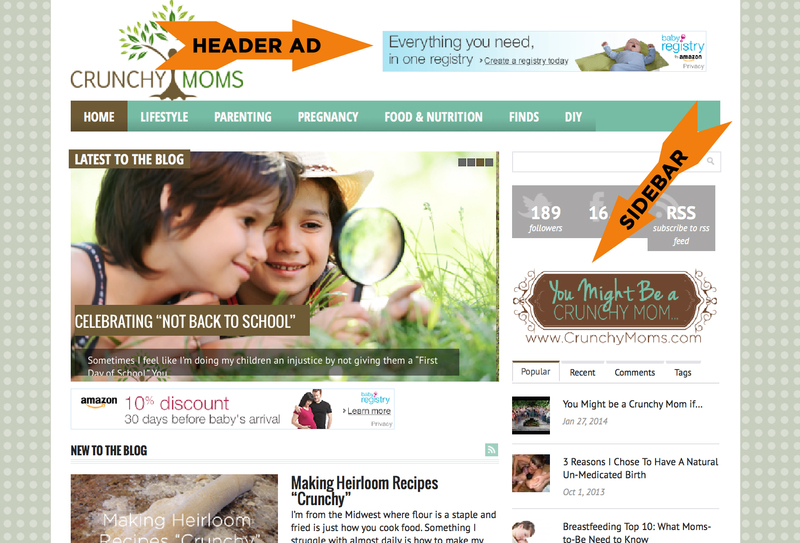 With over 20,000 visitors each month, the header ad is a premium ad space. This ad is viewed on every page of the website. Pricing January through September is $350 per month. Pricing in October through December is $750 per month. One 300×300 side bar and four 125×125 sidebar ads are available each month. Placement of the ads on the sidebar depends on the advertisers needs. The 125×125 ads are always located towards the bottom of the sidebar. The 300×300 ad space at the top of the sidebar (under the search and social icons) is a premium location and is highly visible. This spot is $300 per month. This ad is not visible on the shopping pages, forum or directory. A 300×300 ad midway down the sidebar is $250 per month. Only one 300×300 per month is posted on the website. 125×125 sidebar ads are just $75 per month. If you feel that your website, product or services would be a great fit for Crunchy Moms then please fill out the form below and we’ll email you our advertising packages and rates. Prove that you are not a spam puking robot! Type the letters/numbers you see in the image above.